If you are planning an autumn wedding and you dont want to go down the traditional route of burnt orange and deep reds, you may well like the wedding colour scheme in this post. It mixes colourful autumnal orange tones with a bit of ivory and silvery sage tone foliage, plus lots of lovely cool silver vintage glassware and props, to achieve a slightly more unusual and less predictable autumn scheme. 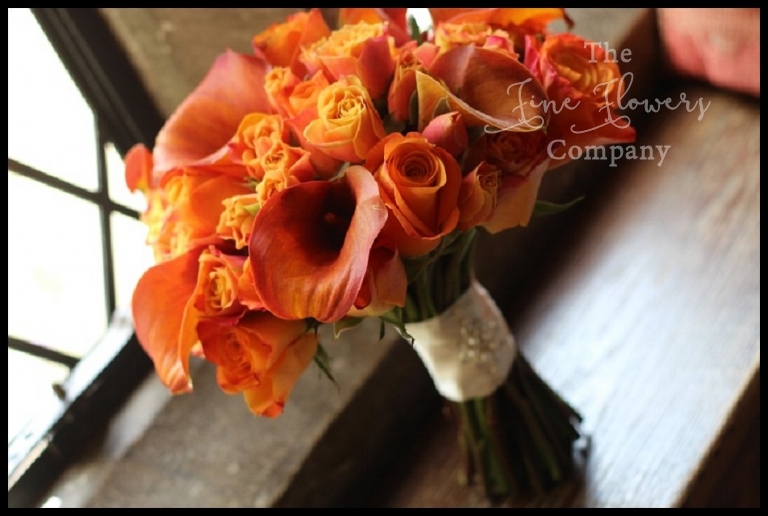 The bridal bouquet was pure burnt orange, with a lovely vibrant mix of orange roses, orange spray roses and Mango calla lilies. The bridesmaids which all wore a lovely hint of silvery sage green dresses, carried more lightweight bouquets to echo the soft pastel colour of their dresses. 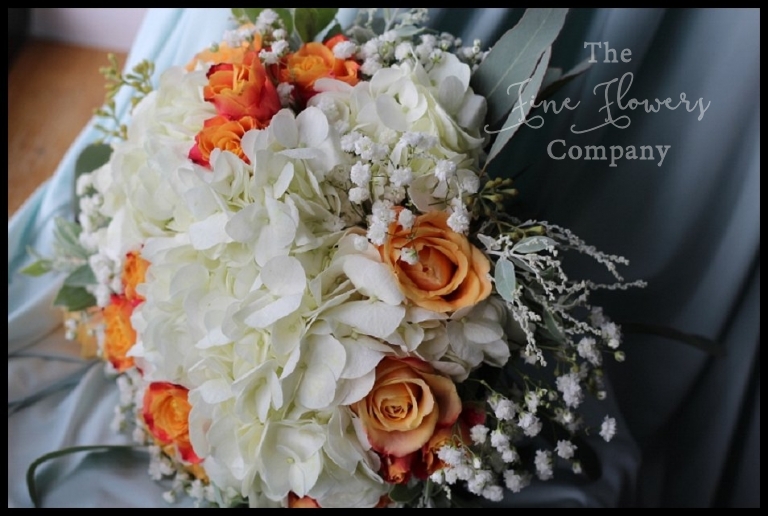 The colour was kept mainly ivory, with creamy ivory hydrangeas and lacey gypsophila, studded through with some orange roses, for a more subtle effect. 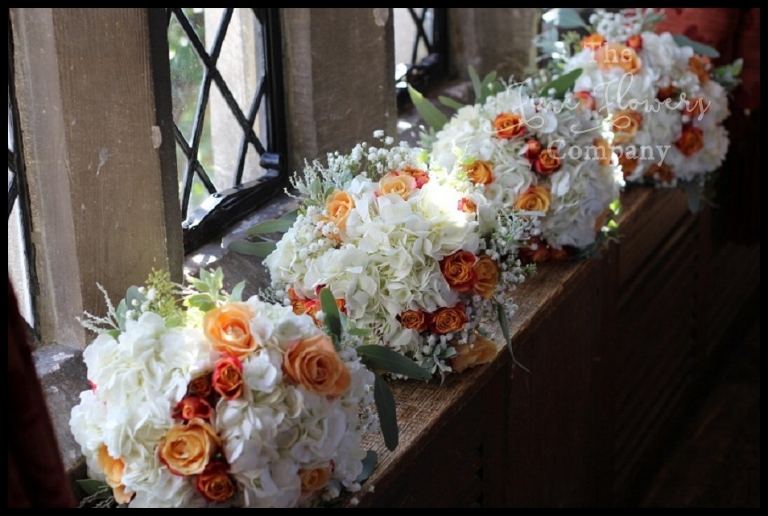 The men wore orange rose buttonholes with gypsophila. All foliage was kept to lovely pale sage green shades using my favourite silvery foliages of all times – eucalyptus and mimosa. The wedding ceremony took place at Great Fosters in Surrey, in the light and airy Orangery. This was dressed simply but elegantly with candelabra centrepieces lining the front of the room, creating a lovely floral backdrop for the wedding ceremony, also with rose petals and candlelit storm vases down the aisle. The ceremony table was styled with clusters of beautiful bright orange roses and berries bouquets, in silver vases, with silver candlesticks and mercury glass silver votives. For the wedding breakfast in the Tithe Barn, the side tables again used clusters of low vases, under teh low ceiling under the eaves, while the central tables under the central part of the barn, where the ceiling is really tall, were dressed with opulent silver candelabra displays with roses, dahlias, asclepsis, berries, mimosa, eucalyptus and accent ivory hydrangeas and gypsophila. If you are planning a wedding at great Fosters take lots more inspiration from our gallery of real favourite weddings at Great Fosters or from our Great Fosters venue pages, both of these featuring an extensive supply of floral decor ideas for this lovely venue.